Jun 1, 2016 | eNews Etc. 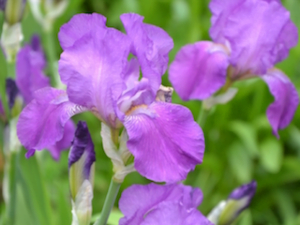 In addition to an explosion of iris blooms, May brought the first wave of warm-season guests, reuniting us with longtime Dharma friends and bringing many new ones. With warmer weather, there’s much to do in the gardens and forests and our visitors dived into Abbey life joyfully. We’ve shared lots of good practice and study along with interesting adventures in offering service—all with the aim to develop our bodhicitta and wisdom. You can read all about it below. May we nurture the gardens of our kindness as we tend the flowers and vegetables of the season! After a delightful, but rainy stay in Aarhus, she and her assistant, Caz, traveled to Copenhagen, where after a rainy first day, the weather turned sunny and bright. Venerable Chodron gave two public talks to a full room and a weekend retreat at the Phendeling Tibetan Buddhist Center. Since most people spoke English, there was no need for translation, so Venerable spoke freely. As on previous stops, the audience here included people from other European nations who had traveled to meet her and hear the teachings. During the weekend retreat, she continued the teachings on Living with an Open Heart (An Open-Hearted Life) that she had begun in Frankfurt. The retreat sparked many good discussions, and a large group of people took refuge and precepts. 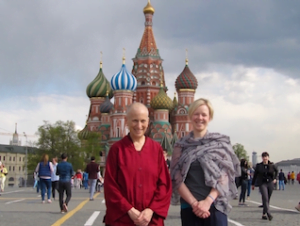 The next stop was Moscow, where Venerable Chodron gave two public talks and, again, the room was full. She and Caz then traveled to a Buddhist retreat center about 2.5 hours outside of Moscow for a four-day retreat on the Four Establishments of Mindfulness. About fifty people attended. The visit concluded with a public talk on the “Four Immeasurables” for all the groups at the retreat center. Venerable Chodron was consistently impressed with the students’ thoughtful questions. 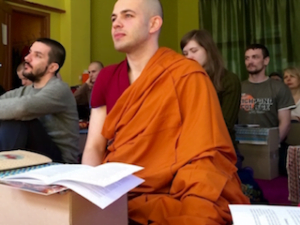 Most attendees were in their twenties and thirties with much enthusiasm for the Dharma. Clearly, they were grateful for the teachings, thought about them deeply, and took them to heart. Upon returning to her home in England, Caz reflected on the trip and wrote about her experience. Photos of the Danish visit are here and the Russian photos are here. 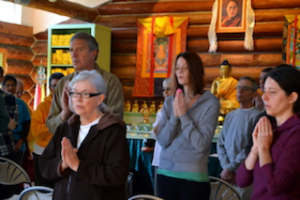 Over forty people gathered for our third annual Kathina Celebration, which we combined with the May Sharing the Dharma Day. And make hearing, thinking, and meditating decline. Households of friends, relations, and benefactors. Venerable Chonyi drew from Venerable Chodron’s commentary in Don’t Believe Everything You Think to examine how attachment leads us into unethical and wrong livelihoods. The talk is here. Immediately after a delicious potluck lunch, the fully ordained monastics headed to the Meditation Hall while the lay guests and novices prepared offerings and formed a procession. Chanting Shakyamuni Buddha’s name, they filed up the hill carrying everything from food offerings to cleaning products to new shoes, as well as a monastic “robe of merit,” which Tanya, our webmaster, ceremonially offered to the Sangha on behalf of the lay supporters. Venerable Semkye gave a beautiful appreciation for the kindness of our benefactors and the significance of the kathina to Abbey monastics. You can watch it here. Venerable Chonyi’s general explanation of the kathina is here. The bhikshuni sangha continued the ceremonies to acknowledge the merit derived from completing our varsa—the monastic “snows retreat”—before reconnecting with the guests for a final dedication of merit. 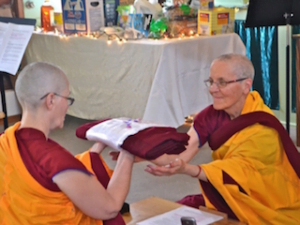 This act of giving the kathina symbolizes the interdependence of the Sangha and the lay community, and the Abbey gratefully and joyfully acknowledges the generosity of our Dharma friends. Photos are here. To celebrate Vesak, the anniversary of the Buddha’s birth, awakening, and parinirvana, twenty-one people did the Nyung Ne retreat together. This is a powerful purification and collection of merit practice. “Nyung Ne” means “abiding in a fast,” the fast being giving up ignorance, attachment, and anger. A physical fast also accompanies this, whereby we take the eight Mahayana precepts for two days, eating one meal and taking fluids on the first day, and abstaining entirely from eating, drinking, and talking on the second. We break the fast the morning of the third day. The beautiful part of the retreat is doing many meditation sessions on 1000-armed Chenrezig, the Buddha of Compassion, who becomes our sole refuge when all our usual distractions are abandoned. 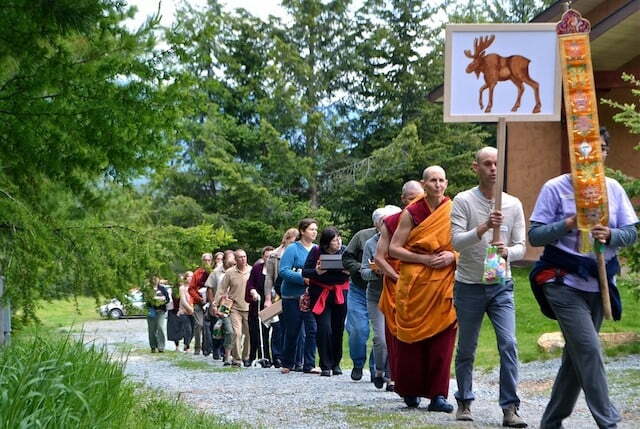 There was tremendous group energy as we bowed to Chenrezig and recited a praise to the Buddha of Compassion. Everyone felt renewed and energetic afterwards. Photos are here. The Memorial Day retreat on HH the Dalai Lama’s book How to See Yourself as You Really Are was special. Every bed at the Abbey was full and a few people stayed at Tara’s Refuge or commuted. We have steadily worked through the book, chapter by chapter, over several years. We began this retreat where we had left off at the segment on the four-point analysis to establish the emptiness of inherent existence. People listened intently to the teachings and many interesting and vibrant discussions followed in the break time. The three daily meditation sessions gave people the opportunity to apply the teachings to their conception of themselves, and the beautiful weather enabled people to relax their minds in the garden. Retreat photos are here. 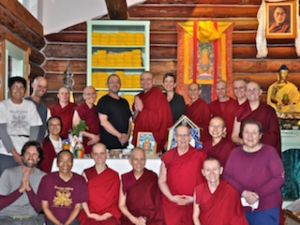 Dharma Friendship Foundation, the center in Seattle where Venerable Chodron was the resident teacher for ten years, kindly gifted the Abbey their large Buddha statue and the complete set of Kangyur (the sutras) and Tengyur (the Indian commentaries on them). We were very excited to receive these precious objects on the first evening of the retreat. Steve and Pam drove the Buddha and texts over in a U-Haul, and then a team of men carried the very heavy statue and weighty texts into Ananda Hall, where they will stay until we build a temple. The moving was a fantastic act of teamwork, with everyone working together, supporting each other (and the statue and texts), and chanting the Buddha’s mantra. Statue-moving photos are here. At the conclusion of the retreat eleven people participated in the refuge and precept-taking ceremony. We’ll continue with the book next year. All the teachings are online here. Now that spring is here we’re busy with outdoor activities again and love working in the warm sunshine. 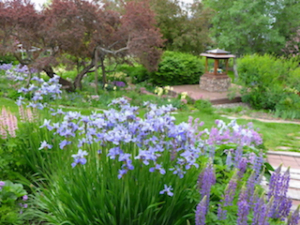 The veggie garden is planted, and the flower garden is bursting with color. We rented a cherry picker for a few days and many of the venerables loved pruning dead branches from the huge willow tree, staining the barn, and trimming one of the trees at Tara’s Refuge. The view of the valley from up high was stupendous. The density of the trees across from the kitchen and Meditation Hall has been a fire hazard, so Venerables Semkye and Losang have been enthusiastically thinning them. We’ll use the wood to heat Ananda Hall this winter. We had lots of help for our first Offering Service Saturday, where people worked on the grounds at the Abbey and at Tara’s Refuge, strung prayer beads, and cleaned up the forest. And we had lots of fun. There’s another one coming up June 4. Drop by if you’re in the neighborhood. Info is here. May service day photos are here. 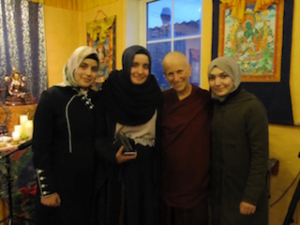 While Venerable Chodron was teaching in Europe, the community did substantial work on Tara’s Refuge. Venerable Yeshe was in charge of painting the old dairy house and its roof, which she accomplished with the help of Tim, Kelly, Dan, and Doug. The next step is to transform the building into a workshop. 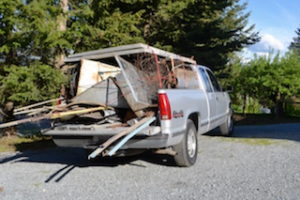 In addition, Venerables Yeshe and Losang filled the back of our truck, Haroldina, with the old pieces of metal scattered around the property and took them to the recycling place. Venerable Losang is now replacing old and broken windows in the house, and he and Stephen have taken down a lot of the old barbed wire fencing that is harmful to wildlife. The most exciting event was mowing the meadows to reduce the knapweed. The land is anything but flat so it takes skill in navigating the large tractor with the mower attached. 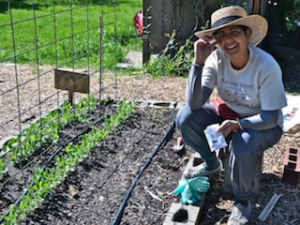 Venerable Samten did part of the mowing—she had to put a sandbag on the driver’s seat to add to her weight because the tractor turns off automatically without a driver. Dave, a local volunteer, kindly did the steep places, but misjudged a turn and wound up with the tractor and mower getting stuck in a bog. It took another large tractor and good ol’ Haroldina, plus an hour and a half, to get it unstuck with a series of daring maneuvers (for a tractor). Abbey Life photos are here. The Abbey’s prison outreach continued with Venerables Tarpa and Semkye going to Walla Walla (WA) State Penitentiary to participate in the annual Buddha Day there. Local Buddhists hosted their visit, and they were happy to share the Dharma with the men in prison. Alicia, who has attended many previous Exploring Monastic Life programs, has moved to the Abbey to begin training! We welcome her. And look what Justin Trudeau, Canada’s prime minister said: “As we celebrate the Buddha’s life and teachings, let us be inspired by his message and continue to put the needs of others before our own. Let us continue our work in pursuit of happiness, peace, and equality for all Canadians and people around the world.” WOW!! In harmony and support, the Abbey community offers Happy Ramadan wishes to Muslims everywhere.